Japan's space agency said its Hayabusa2 spacecraft released an explosive onto an asteroid to make a crater on its surface and collect underground samples to find possible clues to the origin of the solar system. The crater mission was the riskiest for Hayabusa2, as it had to immediately get away so it won't get hit by flying shards from the blast. 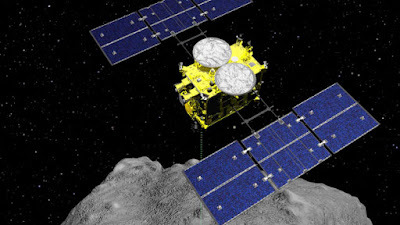 The Japan Aerospace Exploration Agency, or JAXA, said that Hayabusa2 dropped a "small carry-on impactor" made of copper onto the asteroid Friday morning, and that the spacecraft safely evacuated and remained intact. The copper explosive is the size of a baseball weighing 2 kilograms (4.4 pounds). Scientists hope the samples will be crucial to determine the history of the asteroid and our planet. Q. What is the name of the Japanese space agency JAXA's spacecraft that released an explosive onto an asteroid to make a crater on its surface and collect underground samples?